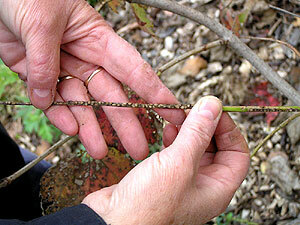 More pictures and information to help you identify egg-laying sites. What to look for: Rows of small bumps, 1 to 2 mm in diameter (between the size of a pin head and match head). The bumps are brownish-black contrasting sharply with greenish to brownish bark. These bumps are not the eggs themselves. Adult females excavate small cavities in the twigs, lay up to eight eggs inside, then seal the egg-laying site with a cap made of chewed bark and excrement held together by a special cement that they make. Where to look: Along the underside of young branches, usually the current season's growth. 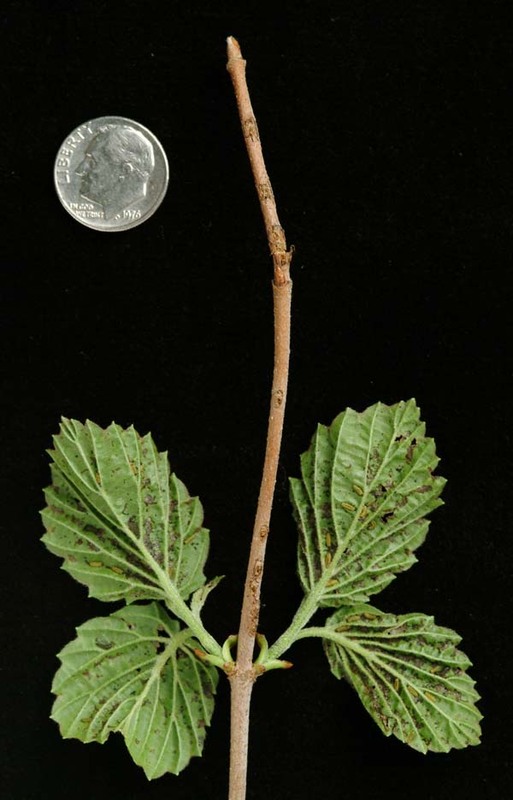 In late summer and fall, you can often find them on stems near leaves where adults have been feeding. (See below.) 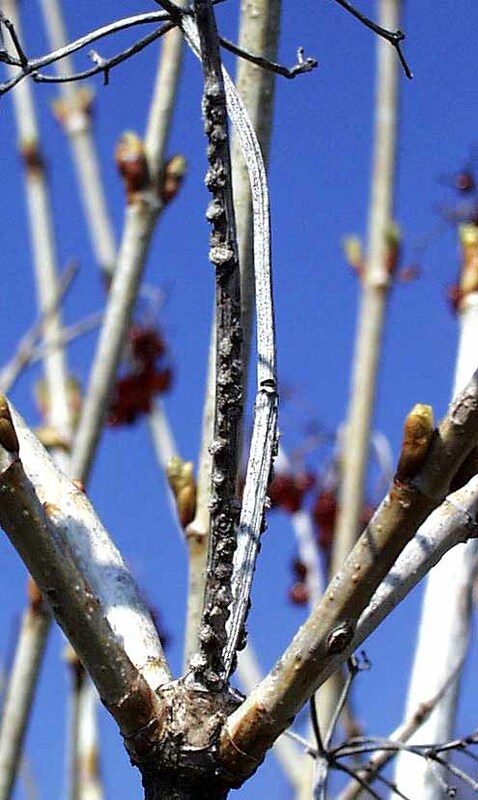 Egg-laying sites are often easier to spot in winter when there are no leaves on the viburnums. 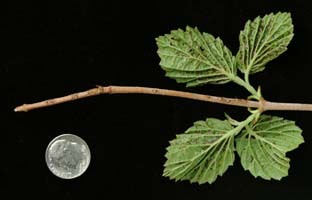 Heavily infested viburnum twigs are easy to spot in fall and winter when the leaves have fallen off the shrubs. These viburnum twigs, collected in early fall, show the characteristic row of capped egg cavities. They also show a range of cap size from nearly flat to highly rounded. 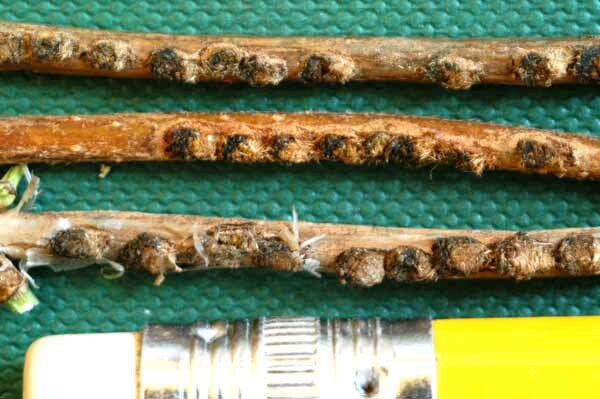 Close up of egg caps on fall-collected twigs. 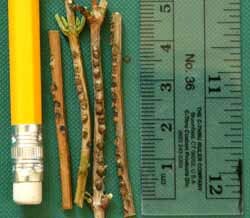 In early spring, as the new leaves emerge and the larvae hatch out of the eggs, you can sometimes spot the old egg-laying sites on dead tips of twigs. 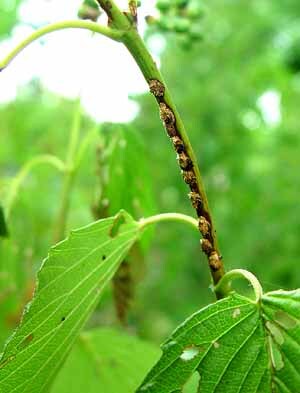 The larvae move down from the egg sites to begin feeding on the new leaves. In summer, newly created egg-laying sites contrast sharply with green stems on this cranberrybush (Viburnum opulus). 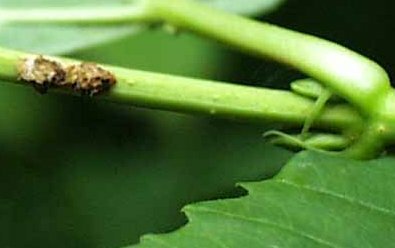 Egg-laying sites adjacent to leaves damaged by feeding adults.